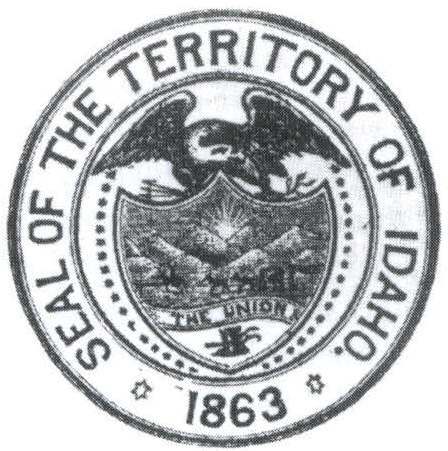 Idaho, admitted to the Union on July 3rd, 1890 as the 43rd state. 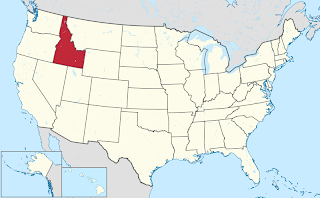 A landlocked state located in the northwest of the US. Also, through its river network, and a system of dams and locks, is also home to America's most inland seaport in the city of Lewiston. Idaho has been inhabited for a very long time, but the first records of Europeans points to French fur trappers. Something that is seen in the French place-names of several towns, such as Nez Perce, and Boise. But it was the Missouri Fur Company that made the first significant push into the land in 1810. Next was the Hudsons Bay Company from Canada, who took control of large parts of the land by 1820. 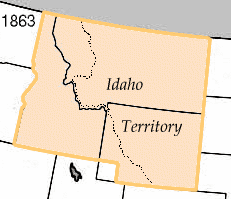 Idaho itself initially became part of Oregon Country. 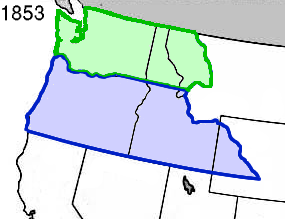 A territory that covered present day British Colombia, parts of Alberta, and the states of Idaho, Oregon, and Washington. 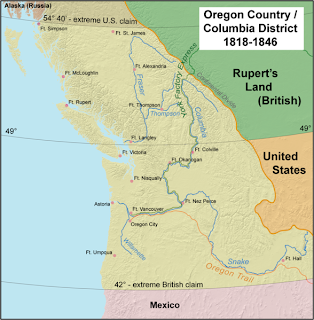 The dispute between Britain and America finally was settled in 1846 with the Oregon Treaty. This finally settled the border dispute between the two nations. The border was extended along the 49th parallel all the way to the coast. Effectively splitting the claim in two. 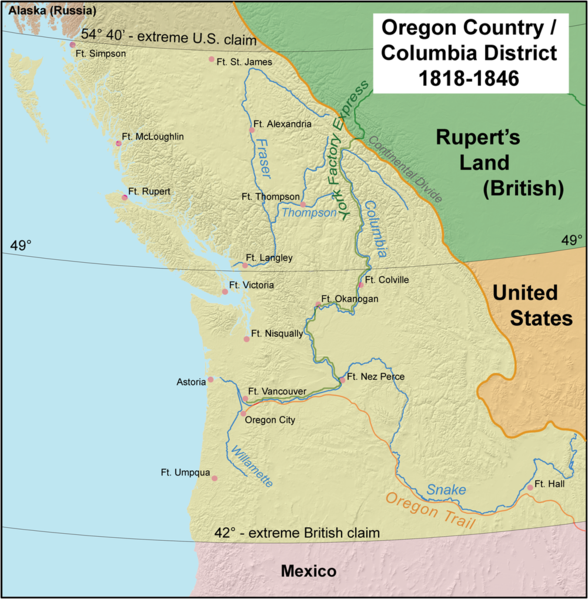 The only exception was Vancouver island, which Britain kept hold of in its entirety. 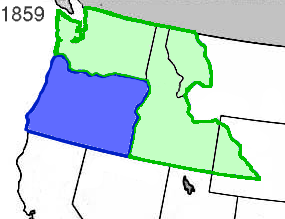 In 1853, Oregon Country was divided into two, with the establishment of the Washington (green) and Oregon (blue) Territories. 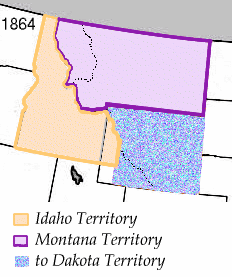 The lands that make up current-day Idaho where reunited when Oregon became a state in 1859, and Washington Territory's boundaries where redrawn. Many people had passed through Idaho on their way to settle in California drew by the gold rush, or where heading along the Oregon trail. But, not many stayed in Idaho. However, in 1860, Idaho saw the start of its own gold rush which saw a large influx of people to mine. The start of the Gold rush also saw Idaho become its own territory, encompassing lands that make up today's Idaho, Montana, and Wyoming. 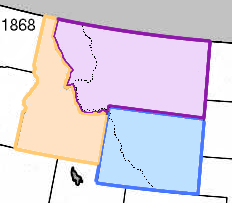 This was, however, broken up in 1863, with the creation of separate Montana and Wyoming territories. And finally, in 1868, a further redraw saw more land being handed to Wyoming, making Wyoming into a rectangle, and giving Idaho its borders we see today. 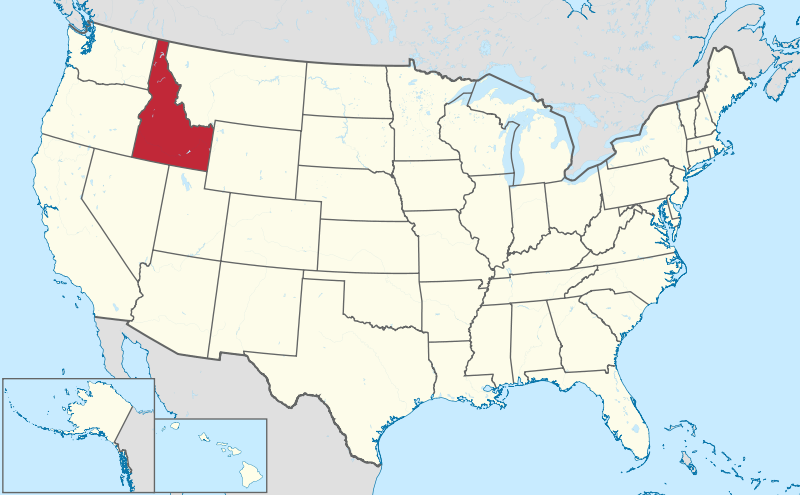 Idaho was finally admitted as a full state into the Union in 1890. The first seal for the state was drawn up in 1863. A shield with a representation of the state, topped by an Eagle. 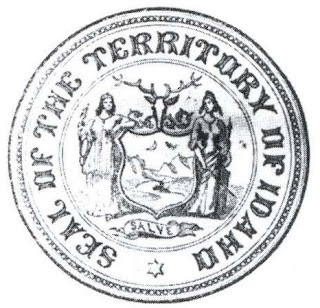 In a ring round the shield is the text "Seal of the Territory of Idaho" and the year "1863" representing the foundation of the territory. It was redrawn in 1866. The shield remained, but this time, the eagle was removed, and replaced with a deer's head. Also, two female supporters where added. The date was also dropped from the seal. The seal underwent a major redraw in 1890 when Idaho was admitted to the Union. The shield remained, with a scene from Idaho. However, the supporters where altered. Now, with Lady Justice, and a miner. The miner represents the main industry in Idaho at the time. On the shield, the pine tree represents Idahos timber forests, the husbandman and the wheat sheaf under the shield together represents the states agriculture. The cornucopia's represents the horticultural elements within the state, and the states flower, the Mock Orange, grows round the feet of Lady Justice. 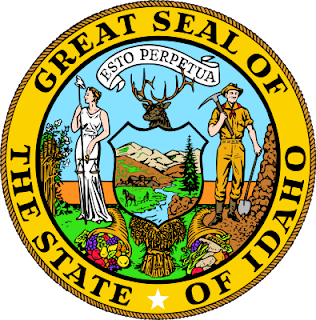 Idaho also has a game law, protecting the elk and moose, and so an elks head is placed above the shield. The text round the shield reads "Great Seal of the State of Idaho" and within above the elk is the states motto, "Esto Perpetua." The flag itself was adopted in 1907, a is a simple blue banner with the state seal placed in the centre. Underneath the seal is a red ribbon bearing the legend "State of Idaho" in gold. 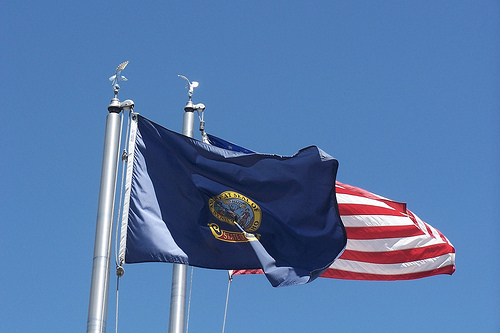 Officially, the flag is supposed to have a gold fringe on three sides, but is quite often displayed without.